Lately, this question has been frequently asked by both parents and kids. We’re going to highlight our research speaking with professional athletes and coaches. At the end of the day, it’s ensuring you or your child has fun in the sports setting they’re most comfortable in. Why Should My Child Play Multiple Sports? Young athletes should play multiple sports for multiple reasons such as learning discipline, learning how to win in close situations and most importantly learning how to be a good teammate. As explained in our free eBook (if you go to viqtorysports.com , you can find a signup sheet on the home page), playing multiple sports can help a player grow not only physically but mentally. We’re going to break down different aspects of playing multiple sports (whatever the sport may be) which can help you get a winning edge. It’s the fourth quarter, last play of the game and the coach calls a play for you to catch the game winning touchdown. Naturally, your adrenaline is through the roof from the game. However, it being your first time in this situation, nerves and uncertain doubts start to set in, on top of the adrenaline rush. The ball is thrown your way and you drop it! A massive disappointment to not only your teammates and coach, but to the entire town that supports you. It happens every year to players around the world. The opportunity for a player to get another chance to make that play in a football game again may not ever happen again/. Now let’s take a 3-sport athlete and put them in the same situation. They’ve already been in a basketball game or a baseball game which they may have faced buzzer beating or a 2 out at-bat situation. The stress an athlete endures during these situations is similar to that of the football game. Having been in these situations from a young age, a multi-sport athlete’s body and mind start to become numb to it. They’re so locked in that they can’t hear the crowd noise, feel any emotion, or be rattled. 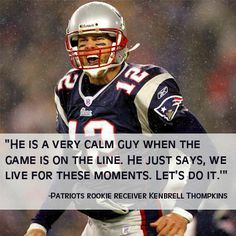 Any great athlete, whether it be Tom Brady or Kobe Bryant have these moments of being locked into the moment. Mostly due to their upbringing of playing multiple sports and being stone cold in the moment. 1.the practice of training people to obey rules or a code of behavior, using punishment to correct disobedience. Discipline is a key component to any sports team. In football, it’s the backbone of every great team. Knowing what you’re suppose to do, when you’re suppose to do it, is the difference between winning and losing. The discipline we’re referring to in this article is the ability to execute your job, be on time, and work hard. All three life essential skills that are also needed in the real world. The mental discipline to correctly block a gap scheme, is the same discipline used to run a ball screen in basketball or to not swing at balls outside the strike zone. Training your mind in the moment of exhaustion, allows for execution in the fatigued moment. Football players are known for having weak hips. Why? If you’re a skill player, there typically isn’t much frequent lateral movement. Unless you’re making a jump cut to avoid a defender, or breaking in/out of a route, engaging in any lateral muscle is almost non existent. Hips are the driving force of speed. Track athletes understand this and use frequent band work to strengthen the hips. Basketball players are consistently moving side to side to cover defenders. Hockey players are consistently engaging their hips and glutes when skating. Naturally, players can improve these muscle groups by simply playing the sport. Mixing in weight training while playing these sports can help players maximize their potential. Playing multiple sports puts you in different scenarios, both good and bad. During tough times, bad teammates are exposed and good teammates are glorified. In situations where things go haywire – whether it be an interception, a fumble or even reacting to a bad call from the coach, your frustration and character is being tested. Being in a competitive environment brings out the emotion and ‘will to win’ that every athlete has buried deep inside of them. It’s a ‘fight or flight’ response that the body naturally emits when put under pressure. Learning how to control these emotions can be wired through living in the scenario multiple times. Similar to how a boxer practices in rounds, or a baseball player takes live batting practice – rapid repetition and mental calamity in a hostile environment can help prepare for the real thing. Players should exert themselves in these situations as much as possible to be better mentally prepared. We believe players should play multiple sports. This is our belief. It’s not the correct answer (if there’s one). It exposes yourself to both mental and physical situations that you would not otherwise encounter, only playing 1 sport. Should My Child Play Multiple Sports? Yes! Have your kids explore what sports they like and don’t like. It also puts your child in a competitive environment to help make it past adversity and grow mentally.